The MD11 AHD 720P delivers outstanding video quality in a compact design measuring in at only two and half inches high and less than one half pound. This camera delivers high definition quality video and allows you to connect to existing analog wiring using the Quick Connect adapter cables. It has built microphone, a 3D gimbal design for flexible aiming, 700 TV line resolution including infrared for day or night imaging. The entire optics package is enclosed in a lightweight, vandal resistant metal enclosure. This camera is perfect for smaller vans or vehicles where space is a premium. 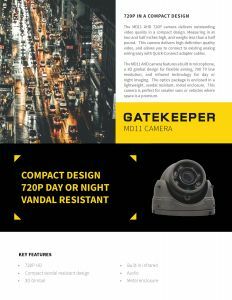 The Gatekeeper MD – Series camera housing includes an integrated microphone allowing high quality audio to be captured at each camera. The integrated IR utilizes 6 infrared LED’s to provide IR illumination at night. A sensor in the camera detects the ambient light and automatically turns on/off the IR LED’s as needed. The housing inherently implements a 3D gimbal design found in more expensive cameras. This allows the base to be mounted in almost any orientation while allowing the camera to be adjusted so that the image is correctly oriented. Not only is the camera constructed of metal but there are set screws that when tightened, prevents the camera aim from being tampered with. This is important for installation where the camera can be accessed, either due to low ceilings or accessible camera placement. An all metal housing creates a vandal proof package that is resistant to physical damage. The housing profile has been carefully designed so that the camera can be aimed 90° laterally and have a clear field of view. This is important for correct aiming when the camera is located at the front of a bus. The MD – Series housing has been designed so that the camera ball cannot be positioned behind the cameras shroud thus reflecting infrared light back into the lens. This reduces the probability of installation error. The ball that houses the camera electronics has no vents thus making the camera resistant to water spray. In order to help reduce camera vibration, a rubber mounting ring is supplied. The rubber ring is installed between the camera base and the mounting surface. The rubber ring conforms to the camera base for easy alignment and quick installation. 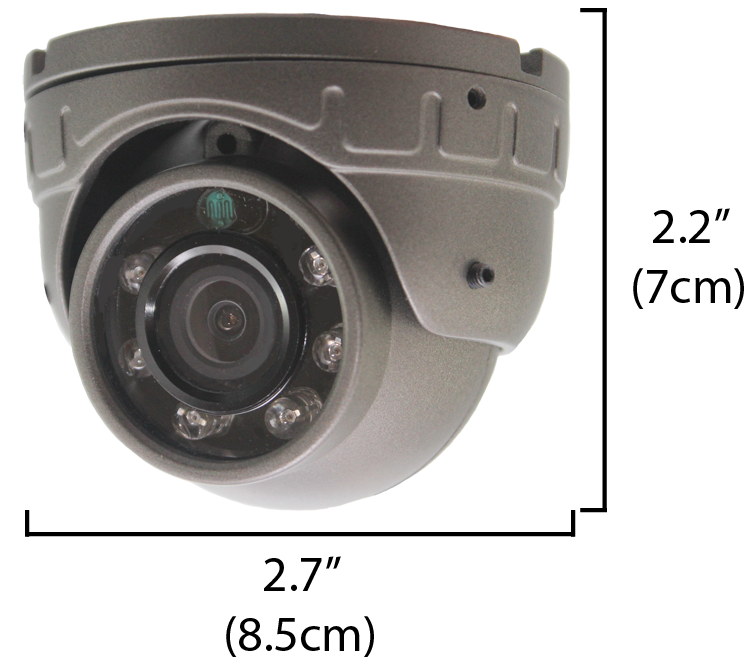 The MD – Series camera is secured with 3 screws that are not accessible once the installation is complete. The camera’s signal cable can be routed directly up through the camera base, so that it’s not exposed. Alternatively, there are 3 cut outs in the base that allows the camera’s signal cable to be routed out the side of the base. This is useful when the camera is mounted to a surface that is not accessible from the rear. 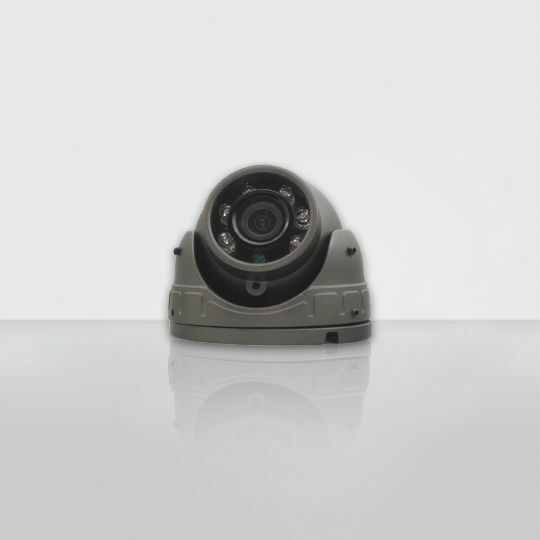 On the front of the MD-Series camera is a flat lens that protects the camera lens from the environment. This flat lens is divided into two concentric circles. The outside circle allows the IR light to exit the camera. The inner circle allows the cameras imaging element to view the scene. A cylindrical sleeve is attached to the flat lens, and delineates the outside and inside circle. This cylinder extends from the flat lens and surrounds the camera lens. This mechanical assembly eliminates internally reflected IR light. Some camera designs have no such mechanism, while other designs use a soft rubber boot that is intended to prevent internal reflected IR from entering the camera lens. In Gatekeeper’s experience, a rubber boot can allow IR light to enter the lens and cause optical flare. This can be exasperated as shorter lens sizes are used. The cylinder shroud used in Gatekeeper’s MD – Series cameras protects from internal reflected IRs still maintained, when shorter lenses is implemented.